Madin finally had to leave. Being from the lowest class, he had suffered exploitation and mistreatment at the hands of his upper-class neighbors all his life. He couldn't handle the abuse anymore. Seeking peace for his family, he knew they could no longer live in their village. Piecing together a new life for their family, Madin and his wife, Ramana, settled into their small shanty. 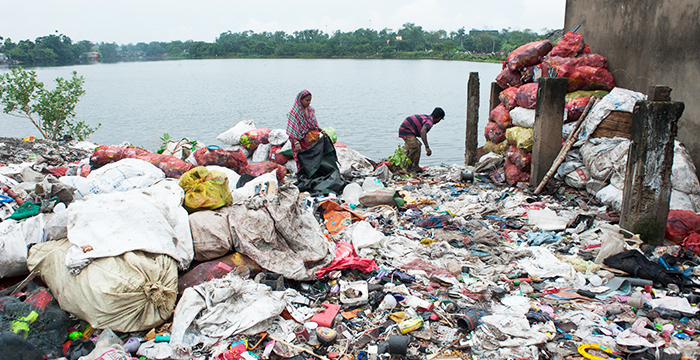 During the day, their three children navigated the crude paths and huge garbage piles dotting the slum. While free from the contempt of their previous neighbors, Madin's and Ramana's job opportunities had not improved. Most of the men worked as day laborers doing backbreaking work to earn meager wages, while the women of the slum worked mainly as ragpickers. Ragpicker is often the only job available to women living in the slums, exposing them to disease and injury as they sort through mounds of garbage for anything they can recycle. The small income they receive helps fill their family's bellies. Ragpickers, an informal yet indispensable part of the waste-management system for many developing countries, sort recyclables from massive trash piles and litter along streets. These recyclable items are then sold to recycling centers, providing the desperately impoverished with a meager income. Considered one of the most dehumanizing jobs in the world, ragpickers are exposed to countless risks and diseases as they sort through human waste, used needles and hazardous materials searching for treasured recyclables. In a slum dotted with mountains of garbage, Madin and Ramana made their home. This was their new life. Madin worried about his children. Madin had escaped ridicule, but poverty had followed him. He seemed doomed to live as an outcast with his children inheriting his fate. Then, one day, Madin heard about a God who loved him. 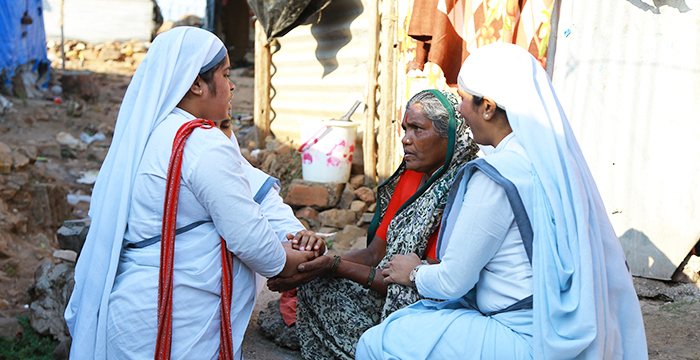 Amaan, a first-year Bible college student, went to Madin's slum to share about God's great love and forgiveness of sins. 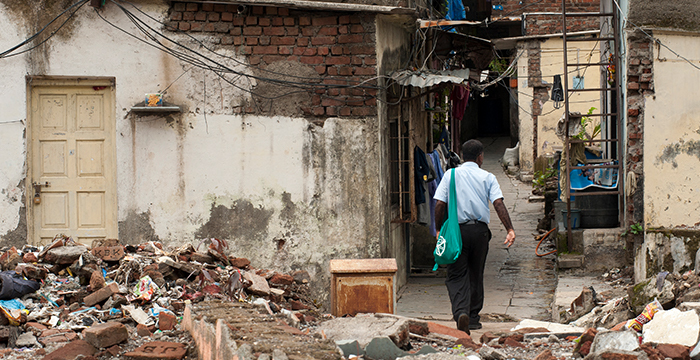 As Amaan walked through the muddy, narrow lanes of the slums, his heart broke for the people living in these conditions. He wanted to help them any way he could to improve their lives. But what could he, a poor, Bible college student, do? When Amaan met Madin, he shared God's Word with this discouraged father. Madin listened attentively to the Bible college student share about the God who accepted them, even though they had always felt so worthless and disposable. This practical demonstration of God's love and provision spoke volumes to residents of the slums. After leaving the slum, Amaan determined in his heart to help Madin and his family. He noticed Madin's children could not read. Knowing the importance of education to open doors out of the slums, Amaan started a weekly literacy class for the kids in the slum, including Madin's. GFA-supported workers reach out to residents of slums, often the only compassionate outside visitors they ever receive. Amaan faithfully taught weekly literacy classes in the slum. One week, as he made his way to the slum, he passed by a mountain of garbage and found a small boy rolling in the refuse, covered in dirt. Shocked, Amaan approached the boy and recognized Madin's son, Savith. Amaan quickly found the boy's parents to ask what happened. Madin shared how, a week before, Savith began acting strangely and kept wanting to go to the garbage pile. They realized he was being afflicted by an evil spirit, so Madin and Ramana took him to a religious leader to perform a sacrifice on behalf of their son. But Savith continued to get worse throughout the week. His distraught parents didn't know what to do. They couldn't afford to take him to get medical attention. They hoped he would somehow heal on his own. 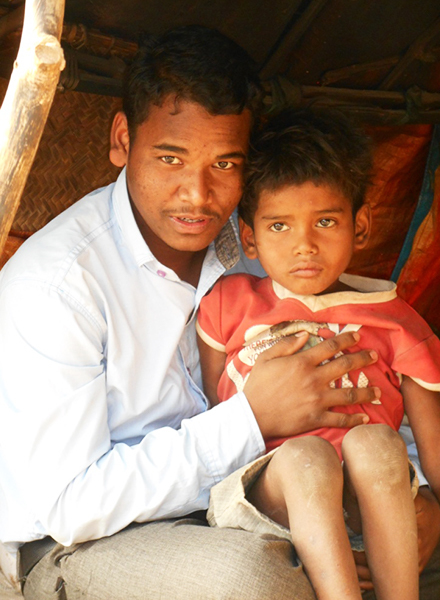 Feeling helpless, Madin and Ramana left their son to roll in the garbage heaps. Amaan (pictured) holds Savith, whom he prayed for when the boy was influenced to roll in garbage heaps by an evil spirit. God miraculously healed Savith after a simple prayer in Jesus' name. Amaan moved closer to the flailing boy. He reached out his hands and offered a simple prayer to Jesus. Savith immediately sat up and looked at Amaan. Encouraged, Amaan talked to the boy, but Savith did not respond. Amaan prayed again, and the tormenting spirit left. Savith stood up, perfectly healthy. Astonishment washed over Madin and Ramana. They did not know the power of God before that moment. "We prayed and went to the temple … but nothing happened to him," the parents explained. "However, you have prayed, and this boy is healed now." Seeing their beloved son restored filled Madin and Ramana with joy. They encouraged Amaan to visit them frequently. "Our door is open for you all the time," they told Amaan. News of the little boy's healing astounded many neighbors in the slum. Intrigued, many came to Madin's house to hear Amaan share from God's Word, and they learned more about this God who had shown Himself so powerful. No longer rejected, Madin now knows acceptance from his Heavenly Father and the love of fellow worshipers—his new eternal family. In 2016, residents in more than 800 slums heard about the love of Christ through GFA-supported workers.3 Slum ministry is unique and requires creativity on the part of national workers. They meet people in desperate and sometimes life-threatening situations.  These compassionate men and women seek to minister to people's physical needs while also ministering to their spiritual needs. Madin and Ramana's journey is unique to them, but the same story plays out countless times as rural residents move to cities looking for a better life, but instead find themselves trapped in a slum. Just like Amaan, this GFA-supported worker is committed to bringing hope to the residents of the slums. As governments grapple with how to provide housing and services for the exploding populations in their cities, GFA-supported workers are bringing hope today into the litter-strewn paths of hundreds of shantytowns across Asia. Thousands of people have found hope in Jesus for today and security for eternity.